On 16 June 2016 Paul, with entourage of Chimka, Deb & Dorothy, went to the Bright Light Center to “handover” the “cheque” for $20,905 AUD to which many of you very kindly donated. Unfortunately, Sebastian was needed to fix brake linings, Bukhu to interpret and Martin to play Man Friday, so they missed being on local Ulaanbaatar TV !!! It was a wonderful to finally meet Munkhchuluun, the main organiser of the charity who also happens to be Bukhu’s oldest sister. Women and children filled the small work area in their rented premises, in an outer suburb of Ulaanbaatar. The women are taught how to make various arts and crafts (bags, jewellery, tapestries, toys, hats, paper cuttings) which are sold at markets etc. Munkhchuluun is excited that some of the money we have donated can go towards the purchase of sewing machines so clothes can be made. What Munkhchuluun emphasised is that the centre not only helps the women gain skills to earn money, but also acts as a social network for the isolated. They know the importance of inspiring confidence and so teach interview techniques and how to present themselves etc. 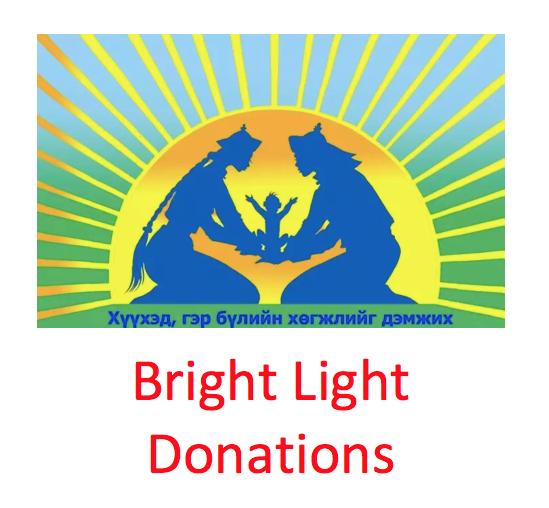 Bright Light itself networks with other organisations so that if a woman has e.g. a legal , medical or psychological issue, they can refer appropriately. Paul handled the interview and camera like a pro, i.e. hands in pockets, whilst Chimka valiantly interpreted ….. Paul’s English has always required interpretation, let alone then translating into Mongolian. However, even our Paul was short for words as he was presented with special scrolls for he and Sebastian, with their names written in flowing traditional script, and a very shiny plaque engraved with “Sir Paul Hickman” & “Sir Sebastian Gross” – it’s in writing so it must be true. Munkhchuluun on right. Childhood friend on left. Friend from working in other charities in the middle. These girls make going on a rally seem a Sunday jaunt. Thank you. Posted in Uncategorized on July 17, 2016 by Sanjay V.